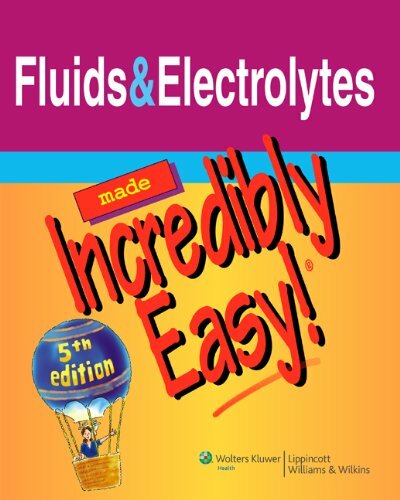 Fully updated and now in full color, Fluids & Electrolytes Made Incredibly Easy, Fifth Edition, reviews the fundamentals of fluids and electrolytes in an entertaining, interesting, and easy-to-understand manner. Organized into four parts, the book uses the well-known Incredibly Easy! approach to provide comprehensive coverage of this challenging topic, including fluid, electrolyte, and acid-base basics; fluid and electrolyte imbalances; the importance and management of imbalances in major health problems; and treatments. Each chapter includes clear, simple explanations of health problems, definitions of key terms, illustrations that clearly explain key concepts, memory joggers, and bullets and checklists that help readers spot important points at a glance. Chapter summaries provide a quick review of vital information.